The staircases on this page are traditional in every sense of the word. At Spittlywood Ltd we were fortunate enough to be commissioned in the restoration of the grand, grade II listed buildings in Wellington Square Hastings. The project had to be completed to strict guidelines as there is a legal requirement for the original features of the building to be maintained. The team worked under the guidance of a government conservation officer, in some cases it was necessary to fully restore long gone original features. Over the years the buildings had been mistreated and many original feautures had been destroyed. 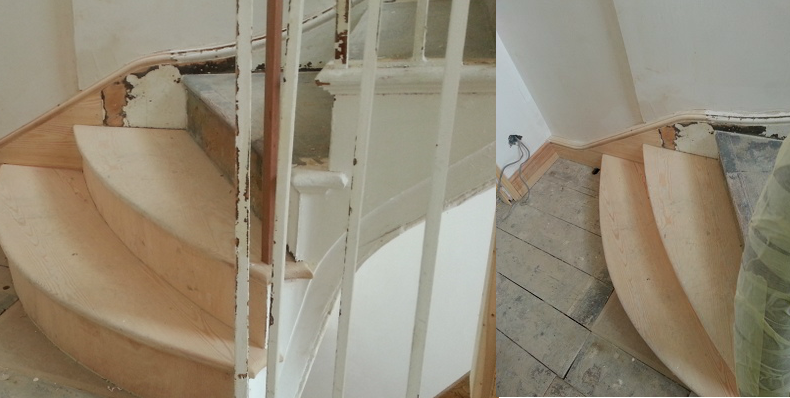 The original radius stair treads had been removed and needed to be re-built and replaced. Spittlywood Ltd have the experience, equipment and know how required in order to complete conservation listed property projects. The team at Spittlywood Ltd renovate wooden staircases or manufacture new bespoke wooden staircases to your requirements using both traditional and modern techniques.